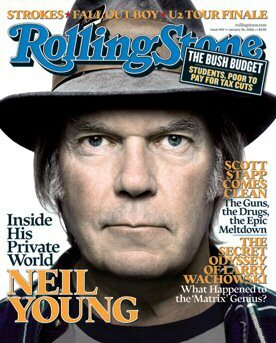 and a new Rolling Stone"
--lyrics from "Crime In The City"
Neil Young is featured on the cover of the new issue of Rolling Stone. "At that point I was different. I wasn't into sports. I wasn't an exceptionally good student -- I didn't have the focus for it. I was a musician. I was more concerned with playing shows on the weekends, and I missed a lot of the social aspects growing up. Instead of thinking about who was I going to pick up at the dance, who was I going to be with or what was I going to do, I was thinking about playing. That whole part of me was put on the back burner until my twenties. I was late that way. I think I moved at a slower rate. In my own head, a lot of times, I'm still twenty. When I dream, I'm very young. I feel that way and I see things that way -- it's my outlook in the dream. I don't see things as a mature person. I feel like everybody's doing this; the human condition is not really understood on the surface; the waking, walking person and the sleeping person are completely different. That's why we need sleep; that's how the soul develops, in sleep." The miraculously magical backstory in 2005 of inducting The Pretenders into the Rock and Roll Hall of Fame, suffering a brain aneurysm, writing and recording "Prairie Wind" prior to brain surgery, and the filming of the Nashville Ryman Concerts for the "Heart of Gold" Film are well documented and an astonishment to behold. We are starting to see a new side of Neil over the past year. As the story title indicates, Neil is really opening up and saying things that he has never been quoted on before. Similar to Bob Dylan's Chronicles book, they are both at that point in their careers where they are trying to set the record straight before they move on to the great beyond. So it's a pretty sobering thought that these immortal beings are contemplating their mortality. But as fans, we're all the big winners. 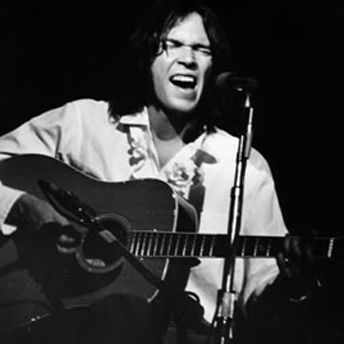 The online issue also links to a Rolling Stone Q&A with Neil Young after the March 01, 1970 concert with Crazy Horse at the Tea Party, Boston, Massachusetts. Each song is given a briefdown in the article and linked to a playlist. "If Young sounds like he's stuck in Eighties overproduction hell, that's because he is. But at least he has Crazy Horse to keep him company, and they blow off steam in a nutty bad-politics travelogue." More on the minor masterpiece "Mideast Vacation": Stop Sniffin' That Smokin' Gun. Thanks for the link e2f! Depression Blues for me. And I reckon not many people have heard it given how poorly that album sold. From Brainwashed: Neil Young: "A lot of the things Neil said related to me. I was amazed because some of the things he stated are things I've been thinking lately, or things that I have felt but hadn't been able to explain. " Neil is looking awesome! I hope when I'm 60 after my hard life I'll look as young. This has been such a year...it's got to be a career peak for Neil. Plus almost dying after his brain aneurysm. That must be what stimulated this burst of creativity. Can't wait for the Feb. 10 premiere of his movie "Heart of Gold." Great title. Let's hope more people see it than "The Year of the Horse" movie from the 1990s. does anyone know where the LA premeire take place?